You’ve probably heard about the back-saving, ultra-responsive wonders of latex mattresses. There are few mattress materials on the market today that garner consistently high ratings for their motion absorption, durability and allergen-free comfort as latex. Latex is the superstar of the mattress world, praised for its natural buoyancy, lasting shape retention and contour ability that relieves shoulder, back and neck pain. Because of its dense composition, latex is said to outperform traditional foam mattresses in terms of longevity, making this a wise investment. Given the growing interest in healthy living and green lifestyle choices, consumers want to know exactly what it is they are purchasing, whether it’s an “organic” edible, a space-saving heater or a new mattress. Let’s take a look at how latex mattresses are made and the difference between 100% natural latex and synthetic latex. 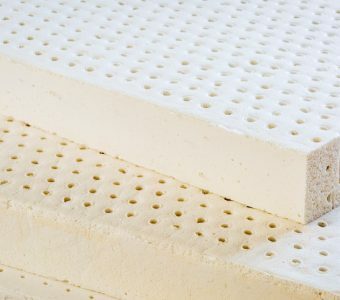 A natural latex mattress is made from the milky substance produced by rubber trees (Hevea Brasiliensis) grown in Indonesia, Thailand, Malaysia and other tropical countries. Not to be confused with sap, latex is an aqueous emulsion that serves as a built-in defense against insects. Once Hevea Brasiliensis reach a certain age, they are tapped for their latex which is then vulcanized and converted into natural rubber. Vulcanization is a process that converts polymer microparticles into more stable, durable materials. An important aspect of 100 percent natural latex mattresses is that there are no petrochemicals or artificial additives used in the manufacturing process. This is particularly important to anyone who wants their mattress to be made of all-natural components, as it reduces the likelihood of allergic reactions. In the interest of cutting costs, some manufacturers add fillers to natural rubber latex. While this lowers the price point considerably, this measure can reduce the lifespan and overall quality of a mattress. Synthetic latex blends will combine natural rubber latex with polyurethane foams, so the key here is looking at purity. When purchasing a new mattress – especially a spendy one– you always want to examine the quality of materials. In the realm of latex mattresses, synthetic blends can still offer supreme comfort and support, but they tend to compress more easily, which means you’ll need to replace it more frequently. When comparing mattresses, look at the percentage of pure rubber latex versus synthetic foam – this will be an indicator of quality. Some brands will carry the Oeko-Tex certification that attests to the purity and high standards of materials used and manufacturing processes employed. Have more questions about latex mattresses? We welcome your inquiries and have plenty of models for you to comfort test in our Portland-area showrooms. You won’t find better prices, selection or service than Mattress World Northwest – come in today and see for yourself!